At the end of December, I did a comprehensive analysis of Yahoo’s Max Games Played rule. Well we’re at that time of year where if you are in a Rotisserie league, you should definitely be aware of your total games played to this point and whether you are projected to overshoot the alloted number of games in your league. So consider this a reminder from someone who is currently tied for 1st place in a Standard Yahoo Rotisserie league, but is projected to far exceed the alloted number of games–check your max games played! This means, if you are running out of games in the Forward position, don’t start picking up sleepers in that same position from the Waiver Wires. If you have superstar Forwards already on your team, play them. The good thing about Yahoo is that if you have a player inserted into your lineup one day, but that player does not play a minute in his game, his mere presence on your roster will not count against your max games played. Unfortunately though, if a player plays even 1 min and doesn’t perform well, not only do you not accumulate fantasy stats, but a game is docked from your max games played. So lets imagine a scenario where your quickly running out of games in the Guard position. 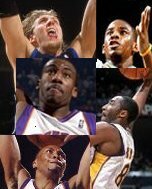 Lets also imagine you have a team STACKED with 5 great guards. The logical response of a manager might be to keep all 5 guards on the team (because they are so good) and exceed the max games played rather early. This is terrible strategy. In this instance I would suggest DROPPING good guards for strong waiver candidates in other positions. A manager needs to keep his emotions and personal player preferences as far away from his team as he can so as to avoid making irrational decisions. So be strategic, if a player isn’t going to help you down the stretch, drop him for a player of another position and accumulate stats there. That’s all I got for now, let me know what advice you might have for managers with max games played problems in the comments above. Yesterday I did a guest interview with Jimmy from NBARoto.com and decided whether I wanted to buy or sell 5 fringe players on the waiver wires: Jameer Nelson, Jamario Moon, Dikembe Mutombo, Mikki Moore and JR Smith. I also gave Jimmy a couple sleepers that I thought would be strong pickups for the duration of the season. The video can be found here on the NBA Roto site. It was fun and I hope you’ll check it out. Just in general, NBARoto.com has become one of the young leaders in fantasy basketball analysis. Not only does it offer great written content, but its video content it superb as well. I definitely have its RSS feed coming into my feed reader and if you are a competitive fantasy basketball manager, I recommend you do so as well. A big shout out to Nels over at Give Me The Rock for linking FantasyBasketballPros.com as an excellent rookie blog yesterday. On the day that Fantasy Basketblog called it quits, Nels also recommended NBARoto.com, and HoopsFantasy.com as two other rookie blogs with excellent, dedicated bloggers. Thanks Nels, we hope to keep producing quality fantasy basketball analysis for our readers. As always, before you leave be sure to add Fantasy Basketball Pros to your feed reader. With teams having well exceeded the midway point of the season and the NBA All-Star game in New Orleans this weekend, we thought we’d take a stab at the All-Fantasy First, Second and Third teams. Who do you think comprises the best fantasy basketball team? Let FBP know in the comments below. Chris Paul (NO, PG) – The number one Yahoo Fantasy Player overall, Paul wows us with 20 points and 10 assists each night and doesn’t have a weakness in his game outside of blocks. Shawn Marion (Mia, SF/PF) – Will his numbers drop in Miami? If one game is any indication, they might. Without a playmaker like Steve Nash, Marion will be hard-pressed to find the open looks he found in Phoenix. Amare Stoudemire (Pho, C) – The more conventional 20 and 10, Stoudemire does everything for a fantasy manager, including shooting at nearly 60% from the field. Kobe Bryant (LAL, SG) – He’s playing less than 40 minutes a game for the first time since 2003. His stats haven’t floundered though. Expect them to rise in the presence of Pau. Dirk Nowitzki (Dal, PF) – The best true PF in the NBA right now fantasy-wise and he’s having an off-year. 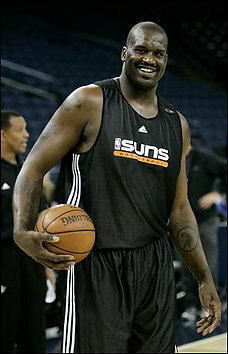 Baron Davis (GS, PG) – why isn’t this guy on the All-Star team? conspiracy anyone? Subscribe to the Fantasy Basketball Pros RSS Feed.